Intensely hydrates and restores to leave hair noticeably softer and smoother. 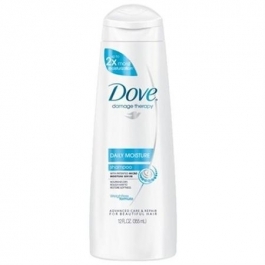 Cleans effectively without stripping hair of essential moisturizers. Water (Aqua), Sodium Laureth Sulfate, Disodium Laureth Sulfosuccinate, Cocamidopropyl Betaine, Ammonium Chloride, Glycol Distearate, Glycerin, Fragrance (Parfum), Dimethiconol, PPG-9, Carbomer, Hydroxypropyl Methylcellulose, Glyceryl Oleate, Amodimethicone, Guar Hydroxypropyltrimonium Chloride, Tetrasodium EDTA, TEA-Dodecylbenzenesulfonate, DMDM Hydantoin, C11-15 Pareth-7, PEG-180M, Laureth-9, Trideceth-12, Lysine HCl, Silk Amino Acids [ Alanine, Glycine, Serine, Arginine, Isoleucine, Cystine, Histidine, Glutamic Acid], Borago Officinalis Seed Oil (Borago Officinalis) [Palmitic Acid, Stearic Acid, Linoleic Acid, Oleic Acid, Eicosenoic Acid], Methylchloroisothiazolinone, Methylisothiazolinone, Ext. Violet 2 (CI 60730).